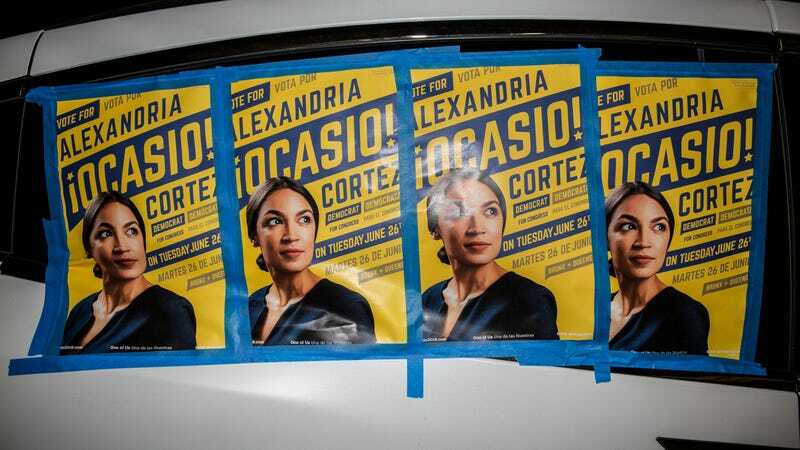 Last night, New York made history: Alexandria Ocasio-Cortez, a 28-year-old Democratic socialist candidate from the Bronx, won the Democratic primary race against the establishment incumbent, Rep. Joe Crowley. Ocasio-Cortez was born to a Puerto Rican mother and a father from the South Bronx; she speaks Spanish and used to work as a bartender and teacher; she acknowledges in a moving, two-minute ad that “Women like me aren’t supposed to run for office.” It was a victory for New York City, for left-wing critics of the Democratic party, for young brown girls in search of a role model—or anyone who’s tired of this news cycle and could use a little good news at this point. Sadly, the coverage of her upset from important news outlets has been extremely disappointing: In an Instagram post, for instance, the New York Times Gender section originally identified Ocasio-Cortez “Ocasio-Ortiz” and didn’t change it until several commenters pointed out the mistake. A tweet from the Associated Press announcing Ocasio-Cortez’s win framed it as a loss for Crowley, leaving her name out of it entirely. The New York Times, as my colleague Megan Greenwell pointed out, never dedicated an article to her grassroots campaign (in which she refused corporate donations and ran on universal health care and the abolition of ICE), only mentioning her in a few candidate round-ups and in the context of Crowley choosing not to debate her. Getting her name wrong is a mistake, and a fairly quiet (while still distinctly telling) one; not covering her or naming her at all is a choice, and likewise, one that speaks volumes about the way national outlets viewed a young girl from the Bronx who, as recently as November of last year, waited tables. But even quieter and even more disconcerting than all of these can be found in a correction tacked on to a New York Times article about Ocasio-Cortez’s win, published today. The correction refers to a sentence in the article describing the outlets that did choose to cover Ocasio-Cortez’s campaign before she won, like the style and news site Refinery29 and the politics and culture site Mic. The article stated incorrectly that Elite Daily, Mic and Refinery29 — popular among millennials and women — were not national outlets. They do, in fact, reach a national audience. An earlier version of this article referred imprecisely to the audience of three media outlets, Elite Daily, Mic and Refinery29. They are most often associated with millennials and female readers, compared to traditional publications, not compared to national publications. The Times’s correction to its correction is currently not publicized on the article’s page. In trying to correct a gross mischaracterization of outlets that, in this case, made the choice to cover the underdog and victor in an ultimately historic congressional race, the first Times correction didn’t seem to encapsulate what the paper got so wrong in the first place. Here’s what it is: Strongly implying that outlets like Elite Daily, Mic, and Refinery29 do not reach a national audience because they are popular with women and millennials (who—surprise!—can be found all over the country) is not only inaccurate, but also conveys a skepticism towards young people and women. It’s a skepticism that is wholly undeserved, as those readers—who, by the way, are also reading the Times—are getting their news about progressive candidates like Ocasio-Cortez one way or another and yesterday, walked into polls armed with that knowledge. They, along with all the other constituents who voted for Ocasio-Cortez, rang in this moment, and those who hasn’t been paying close enough attention were left to play a lot of catch-up. There is a long list of things to be skeptical of in these trying times—but editorial decisions that put women and young people near the top of the list are decisions that directly reveal a lot about certain outlets’ short-sightedness. And the young, progressive left is listening.